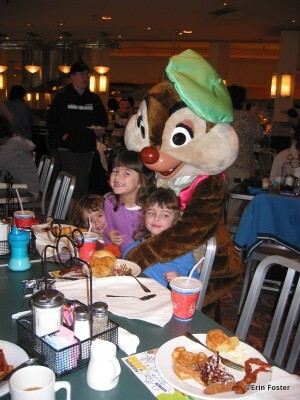 Disney Food for Families columnist Erin Foster has some great character meal tips for your fam! 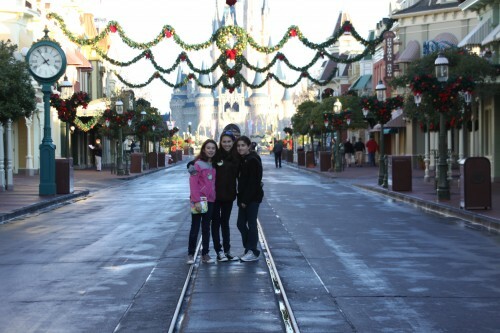 I spent a recent weekend reminiscing over old photos, many of which featured family trips to the Disney Parks. While flipping through the albums, one of my girls commented that the photos were, to put it mildly, character meal intensive. 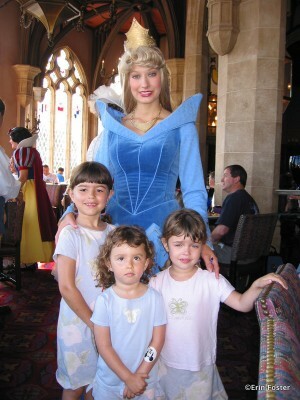 So we started counting, going back to my oldest daughter’s first trip to Walt Disney World in May of 1998. I have photographic evidence of having been to character meals with my family at least 93 times since then. 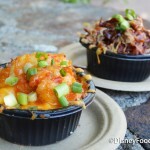 These meals took place at Disneyland, Disneyland Paris, and most predominantly at Walt Disney World, including each of the character meals currently available there, plus the now defunct meals at the Magic Kingdom’s Liberty Tree Tavern, Animal Kingdom’s Restaurantosaurus and what is now Fulton’s Crab House at Downtown Disney. Our single highest visit count is at the Magic Kingdom’s Crystal Palace, with 17 separate visits. Liberty Tree Tavern character meal. Gone but not forgotten. To experience character interaction without lines. To take a break from touring. To fill time on a non-park day. To have family bonding time. Each of these reasons for dining will give you a slightly different approach to your planning. For example, if you’re using a character meal to add an element of whimsy to a non-park day, then you’ll need to book your meal at one of the character meals held outside the theme parks. If you’re dining so that your little princess can get some face time with her best pal Belle, then finding a meal featuring Belle will be a priority. Perhaps less obviously, if you’re planning to use a character meal as a chance to spend quality time with a group, perhaps at a family reunion, then you may want to avoid the buffet-style character meals. There is lots of movement back and forth to the food at a buffet. If your goal is chatting, or getting group photos with characters, then a family-style (Garden Grill) or menu-based (Akershus) character meal may be a better choice. Similarly, if you’re a single parent with small children, the up-and-down dynamics of a buffet may prove challenging. If you’re looking for an air-conditioned respite from touring, then book a mid-day meal at your park of the day or at a nearby resort. You may want to check the DFB Choosing a Character Meal page for other factors that may impact your venue choice. The flow of your day can be positively or negatively impacted depending on when you decide to eat. One of the reasons my family is partial to the Crystal Palace is that we’re early risers and we love taking family photos on Main Street at the Magic Kingdom. An unexpected perk of having the earliest Crystal Palace or Cinderella’s Royal Table reservation time on a non-Extra-Magic morning is that you will be admitted into the park ahead of other guests, allowing you to experience a nearly empty Main Street USA. Capitalize on this unique situation by commandeering a cast member to capture the moment. You and the castle with no one else in the background. Magical! On our way to an early Crystal Palace meal in a near empty Magic Kingdom. Timing your character meal right can also help you save a bit of cash. In several places, character breakfasts are served until 10:30 or 11:00 a.m. and cost significantly less cost than lunch. Grab a quick granola bar in your room, tour in the early morning when the lines are shortest, and then eat breakfast for lunch. Booking a character meal at the end of a serving session may also get you a slightly superior character experience. The characters stick around throughout the entire time guests are being served, but at the end of a meal many guests will finish and exit the restaurant, leaving fewer guests for the characters to interact with. A few months ago, I dined with my daughters at Epcot’s Garden Grill at nearly 8:00 p.m. As many of the earlier dining guests had departed, Mickey and the gang had more time to spend with us. We had a particularly prolonged exchange with Chip about our meal and about the merits of a recent film release — all via mime and handwritten notes. Who knew Chip was a fan of the sci-fi genre? While the presence of Donald Duck is enough to send anyone into a tailspin, it’s important to remember that manners matter, both for children and adults. For adults, this can mean being respectful of other guests’ time. The characters are more than willing to have quality moments with your family, but everyone else wants that, too. Don’t waste your time and theirs by fumbling with your lens cap or looking for a blank page in the autograph book. Be gracious to the characters and they'll be gracious to you. Keep an eye out for where the characters are in the room. 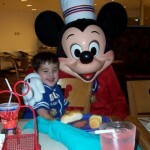 If Mickey is within your section of the restaurant, put a hold on trips to the buffet and wait for him to arrive at your table. The waffles will still be there, and having your entire group at the table prevents others from having to wait while you go extract Junior from the dessert station. This is also a great time to remind your children of their manners. 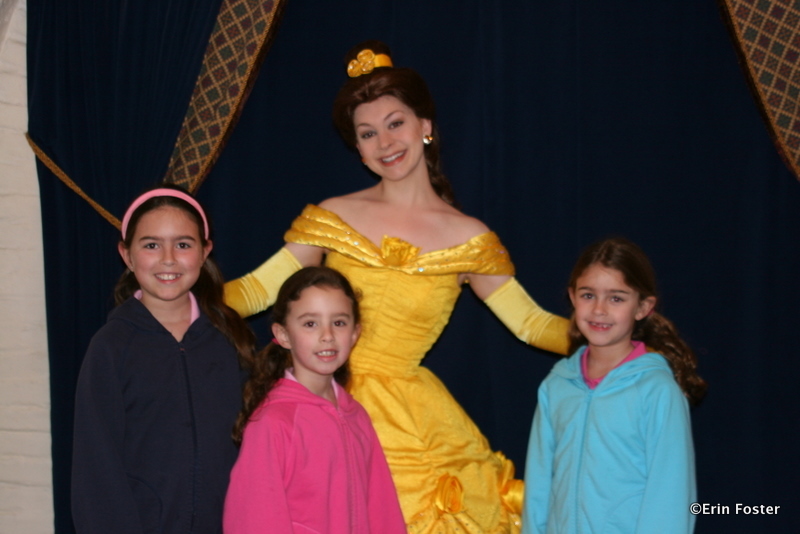 Tell them you expect them to respect other guests by waiting their turn for time with the characters. And tell them to respect the characters by not jumping on them, pulling their tail, or making any other unexpected movements. You’ll also want them to thank the characters for their time. While Mickey has many talents, he is not a mind reader. Let him know if you need something special. For example, when my family takes photos with characters, we often want a group shot and then individual shots with each child. We tell the character this at the outset of our greeting so that he knows not to rush off after the first photo. The characters have limited sightlines. Let them know verbally if you are passing behind him or if there is a child underfoot. You’re apt to have a much more memorable character interaction if you give the character something unique to do or discuss. This could mean bringing a plush Mickey to meet Mickey. Or perhaps bringing a plush Mickey to meet Donald. A prop gives the character something to react to. For example, Donald can act miffed that he’s not your favorite. Chip liked playing with our toy. If you are meeting your child’s favorite character, let the character know. Maybe he or she will be flattered and give your child an extra hug or kiss. If you are encountering a character for the second (or third, or fourth) time, try to “remind” the character about this. Try saying something to Cinderella like, “Hi Cinderella, I’m sure you remember my daughter Josie. She loved meeting you at breakfast last year.” Again, this allows her additional conversation points. 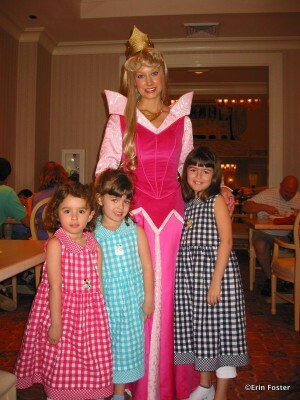 We met Sleeping Beauty at the Royal Table. For the “face” characters (those like the princesses who can actually speak), try bringing up a topic of conversation. I dined at the princess meal at 1900 Park Fare just prior to the wedding of Prince William and Kate Middleton. My daughters asked Cinderella and her step sister whether they had been invited to the Royal Wedding. The responses were priceless. Always, always, always tell your server if you’re celebrating something special. While preferential treatment is never guaranteed, birthday and anniversary celebrants are often gifted with a free cupcake or other small surprise. Be sure to tell your server up front whether you have any unique payment requirements such as separate checks for different party members or if you’re using the Disney Dining Plan as payment or will be using the Tables in Wonderland card. This creates less busy work for the server and can greatly speed up your departure wait. Let the server know if you need to eat quickly to make it to a show or to take advantage of a Fastpass window. They can keep the pace of your meal moving if you’re in a hurry. If you absolutely need to eat quickly, try asking for the check at the beginning of the meal, right after you’ve ordered. This way all the paperwork can be taken care of while you’re consuming your meal and then you can bolt as soon as you’re done eating. 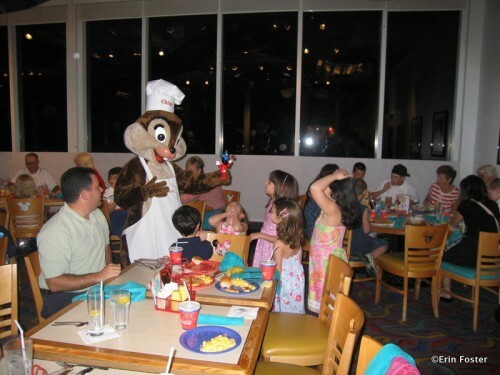 Most character dining experiences will have a cast member obviously dedicated to overseeing the characters. If you have something that you need all the characters to know, then the character handler is a good person to seek out. For example, the handlers can help if you know your child is wary of characters and you need them to approach your table very slowly, or even skip your table entirely. Be aware that some children do wear costumes for character meals (particularly the princess-themed meals), but this is in no way a requirement. In my experience, somewhere in the neighborhood of half the girls ages 2-8 will be wearing costumes to Cinderella’s Royal Table. Does your child WANT to dress up? Will your child wear the costume all day or just for the meal? If it’s just for the meal, what will you do with the costume at other times? If you want to have a bit of the princess look without being encumbered by the full regalia, try sporting just regal accessories. Have your daughter wear a tiara with her jeans and she’ll be a comfortable, modern royal. You don't have to dress up to be a princess. Also be aware that if you do decide to dress your daughter for a princess meal, there is no requirement that the costume be purchased at Walt Disney World or even be an official Disney costume at all. Some of the most wonderful costumes I’ve seen at character meals have been homemade. 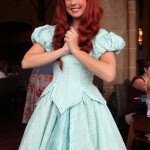 You can also find inexpensive Disney costumes at buycostumes.com and big box stores such as Walmart and Target. Try stocking up just after Halloween for the best bargains. When looking at my family’s many character meal photos, there were clearly some that worked and some that didn’t. Those with problems almost always had a member of some other family featured prominently in the background, often stuffing his face. Others that were less than lovely had a foreground filled with dirty dishes or a chair blocking a child. Before the characters approach your table, take just a moment to assess how you can make your picture mantle-worthy. Look for the shooting angle with the least distracting background and move some of the clutter out of the way. There are about 15 things wrong with this picture. Try to set the stage for a better shot. Also be aware of the relative size of the characters in relation to the members of your party. Goofy = HUGE. Unless he bends down, it’s almost impossible to compose a good shot with him and a standing preschooler (unless you’re going for comic effect). Try standing the child on a chair for better ability to focus on the faces. You can also improve your photo by creating a unique pose. We’ve jumped with Tigger (be careful of little ones underfoot), juggled with Mickey, and had the family pose totem-pole-style with Piglet. Work out your strategy in advance to minimize wait times for other guests. Also, be sure to ask for help if you’d like a shot of the entire family at your meal. Your server, the character handler, and most other guests will be happy to assist. Sure Chef Mickey’s is fun, but there are a dozen other ways to dine with characters including a tea party, Mickey’s Backyard BBQ and venues in every theme park and many of the deluxe resorts. In my book, the food at the Tusker House buffet at the Animal Kingdom is more reliable than Chef Mickey’s, it’s easier to get a reservation at the Beach Club’s Cape May Cafe, and conversation is easier at Epcot’s Garden Grill. These all have top-notch character interaction as well. 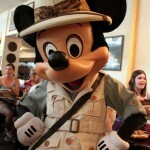 My money's on the Safari Breakfast at Tusker House for a great meal. Character meals aren’t just for kids. Some of my best character meal experiences have been when I’ve dined with other adults. On a recent trip with another family, the mom and I had great fun faux flirting with Prince Charming at 1900 Park Fare. I’ve even had a great time as an adult dining solo at a character meal. With all the visits and attention from characters, it’s barely like you’re dining alone at all. So what’s your best tip for character dining? Do you have a strategy for getting the most out of your meal and Mickey? Let us know in the comments below. 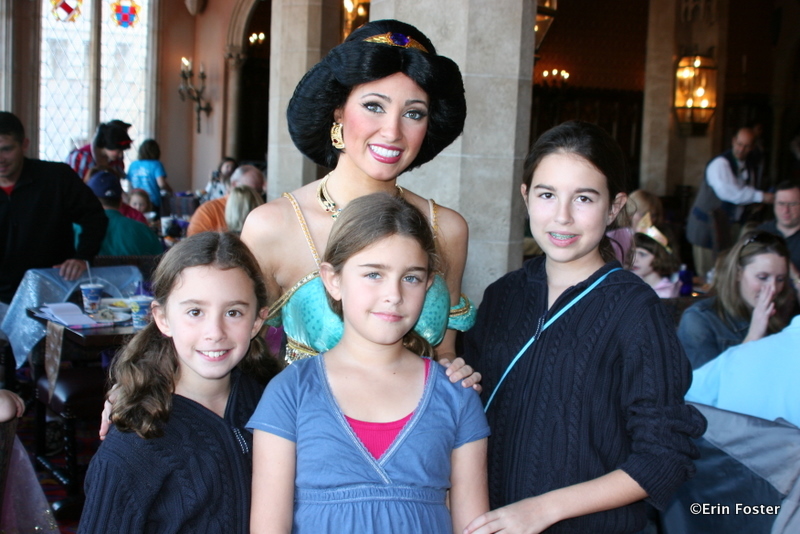 Wondering what character meal is right for your family? 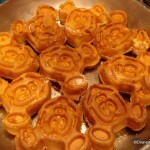 Don’t forget to check out Erin’s guide to choosing the best Disney World character meal! Nice article. There’s some good tips. Lots of little things you might not actually think of in advance. Great tips, I will utilize a couple of these suggestions during my Storyteller’s Cafe breakfast in a few minutes. Thanks. Great tips!! My boys are at the age now (9 and 7) where they like the character interaction but are a little embarrassed that they like it, so they’re not always jumping out of their skin with excitement when the characters visit our table. Instead they turn shy and quiet. I like the idea of having a prop or toy or something to get a reaction from the character that will pave the way for interaction with the kids. My husband and I dined at 1900 Park Fare for breakfast in Feb and I had brought my stuffed yellow Angry Bird that I had just gotten for my birthday. When Tigger approach our table he got SO excited to see it and promptly threw it across the room! It totally made my day! Great tips. I have ADRs for three character meals during my trip in November. 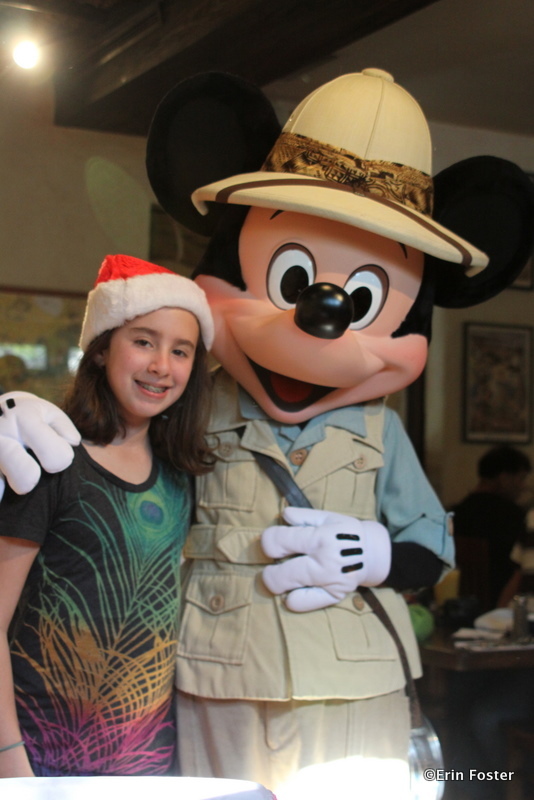 Dinner at Chef Mickeys and Crystal Palace plus breakfast at the Tusker House. Love the tips! Especially #11, mostly cause I am an adult going to WDW without kids and have an ADR for breakfast at Crystal Palace, haha! I will for sure be making note of your tips for my trip. Great tips, I especially like the photo tips, looking back at our pics I could have done a much better job of staging. When we decided to plan our upcoming trip to Disney my husband and both kids had only one character meal request – Garden Grill. They loved the rotating resturant, they loved that the Characters spent plenty of time at each table, and they loved that they didn’t feel rushed. My DD, age 7, did love dinner at the palace, but she said if she had to pick she would much rather do Garden Grill than the palace. p.s. now that The Socerers of the Magic Kingdom game is coming what are the chances of a villians meal? I would love love love to have dinner with Gaston, Cruella, Maleficent and company. It is fun to be ornery with characters too! With 3 grown women at a character meal, I wondered what we were going to do. My friend responded by reffering to Tigger as Tony the Tiger! His response was priceless!! We laughed so hard that we cried! Another friend giddily ate bacon in front of Piglet- who responded with horror! Hysterical!! Awesome tips. I will definitely be bookmarking this page! I can’t wait to see Eeyore & Goofy! When we went for our official honeymoon, I remember doing the naughty but oh-so fun drinking round the world at Epcot (or ‘Journey into intoxication’ as I just read and laughed at) and by the time we made it to Canada, we just managed to catch the bears before they went ‘off duty’, and we had an absolute blast with them. When my husband and I were first dating, I took him to disney for his first time and we dined at with Characters for breakfast. Although by looking around we realized we were probably the only table without kids, we love it. The characters took pictures with us just like the kids. We go to that restaurant yearly with our 3 kids now! Another fun one was trying to talk like Donald to Donald. Donald’s reaction to my husband speaking like him was priceless! Thanks for the tips! This is my 2nd trip ever to Disney (first time when I was 3!). I have the Tusker House breakfast scheduled at 8:10 (AK opening at 9). Will we be able to get into the park early or does that only apply to MK? All the tips from the article are great! 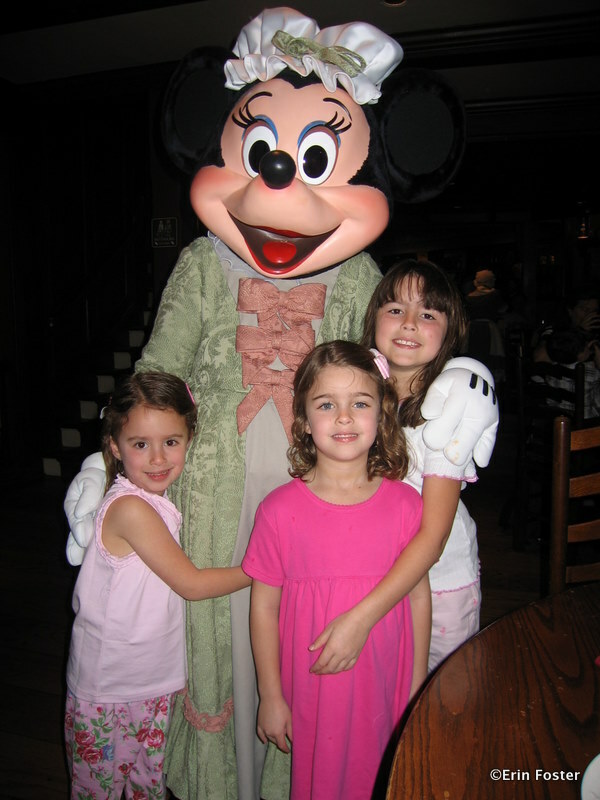 I also have some extra personal advice to share, I live 10 minutes from Disney and have 2 daughters (ages 3 and 4) that think Disney World is a daycare center (we go 2-4 times per week). The best advice is to parents that have young (under age 3) kids is don’t think that they’re too young to like it, it’s the best time since they are still free to eat! Unfortunately we’ve cut back some on our character meals a bit since the kids are now both paying customers because there is no way they eat their moneys worth, but it was great when they snacked on the adults fare. The second is the Crystal Palace which was mentioned in the article, they have the infant high chairs which look more like a car seat “bucket” so if your little one can’t sit up straight yet, mom and dad can still enjoy a character meal without holding baby throughout the entire meal. I have to say the food at the Garden Grill in Epcot is awesome (most of it grown in the greenhouses underneath) but you have to be creative with the angles to get the perfect picture as the tables are not very large and it’s a circular, rotating restaraunt, so jumping up to take a picture from a couple feet back is almost impossible when they are busy. We always loved the Cape May Cafe and really enjoy the Garden Grove at the Swan because there seems to be a much smaller crowd there. The only downfall of the Garden Grove is only one character comes out at once (at least it was that way the last 3 times we ate there but it’s bee about 10 months), I’m also picky at the Garden Grove about the “theme” so you have to see which night of the week you want to dine on, they have an Italian, a Southern BBQ, and a Seafood night, they rotate throughout the week, so it’s good to know which menu you are signing up for before booking. I hope the extra info helps! Great tips for families and others! I’ve been here for 20 yrs. and haven’t done EVERYTHING yet! Just dined at the Garden Grill Character dinner and it was fantastic. Not having small children with us the characters still “played” and Dale/Chip even sneaked up on me and went BOO! Lots of recommendations for almost every restaurant in Disney. Planning is the key!! We brought Duffy to meet Mickey, Minnie, and Duffy. So much fun! Character meals are great, always a good time! A couple of times we’ve had kids try to crash our time and the handler CM’s are always great as controlling the situation. This is one of those times where cost shouldn’t matter for at least one visit. When we show people our photos they always like the character interaction shots! And most times they are our favorite memories. I regularly use one of the photos of me and Goofy on my Facebook page. For a lifetime of memories (if you can only visit once) the personal interaction of character meals will always be your fondest memories so be sure to get many, many photos! Looks like it could really bring a lot of joy to the dining experience. Especially for kids that just don’t like to eat like my two sons…! Kathlyn, such a good reminder! Will there be Memory Maker photographers at character meals? We purchased the photo package and are dining at Cinderella’s Royal Table. Laura, the Memory Maker should include your picture with Cinderella, which is taken in the foyer before you’re brought up to the dining room. We have not seen a PhotoPass Photographer in the dining room during the other princess meet-and-greets.